Giant Round Medieval Dungeon Padlock. 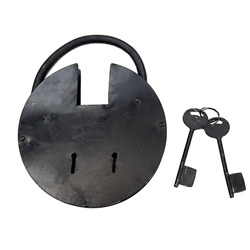 This ancient style of round or pancake lock was in use for hundreds of years and became popular with the Post Office when mail and money was transported in the Old West by stage or rail. An ideal way to keep your riches or captive secure. All steel construction. Each is hand made to look and function as the originals. Keep your dungeon secure. Includes two keys. Large Round Padlock also available.